NSG Group has outlined an initiative by its Business Innovation Center (BIC) to drive business development and announced the launch of the mobile real-time PCR device. 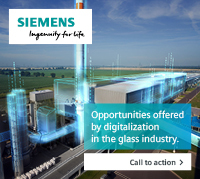 Established in July 2018 to lead business development, BIC is focused on commercialising NSG’s promising glass technologies in new glass business areas, including life science (safety of water and food, environment and academia), IoT, Cloud (5G, sensors, filters), energy conversion (functional material) and Industry 4.0 (digital manufacturing). Reports suggest that private equity group Apollo is preparing Verallia for a stock market listing later this year, in what could become one of the largest French initial public offerings of the year. According to international news organisation Reuters, Apollo has asked banks to pitch for roles in organising the flotation, which could value Verallia at more than €4 billion. Over the past three years, O-I has invested $6 million in collections schemes around the world to improve recycling infrastructure. In 2017, the company achieved a global average of 38% recycled glass in its bottles, as it works towards a target of 50% by 2025. European figures already exceed this amount, with green glass containing approximately 80% recycled glass. Gerresheimer closed off its first quarter to February 2019 with positive growth. “Our new financial year got off to a good start” Dietmar Siemssen, CEO confirmed. Revenue increased by 6.3% to €308.5 million, compared to €290.4 million in the prior year quarter. Sales of injection vials, ampoules and cartridges did well, as did sales of moulded glass for medicines and cosmetics. Revenues with prefillable glass syringes also increased significantly. Following the devastating fire that partially destroyed Notre-Dame cathedral in Paris, Saint-Gobain Group has confirmed it will offer expertise in renovation and construction materials, notably to help restore the stained glass windows. The group is also looking at other ways of providing support. Saint-Gobain is committed to culture and heritage preservation and is one of the main sponsors for the restoration of the Royal Chapel at the Palace of Versailles. Leading French domestic glassware producer, Arc is successfully continuing its transformation, launched after recapitalisation in 2015. The company has returned to commercial success with growth in sales volume and a renewed focus on innovation. Following this success, last year the company moved on to the second phase of its transformation.